Stephen “Shanghai Six” Machuga graduated from Purdue University and its ROTC program in 1998. He served as infantry officer at Fort Bragg where he earned both his Airborne and Ranger tabs. In 2003, while with the Fort Lewis-based 2nd Infantry Division out of Washington, he was deployed to Iraq. One day, his company received a box of second-hand romance novels, meant as a morale-boosting gift to the troops. While well intentioned, it wasn't exactly the ideal gift for a bunch of combat soldiers deployed to Iraq, but typified the type of care packages received. 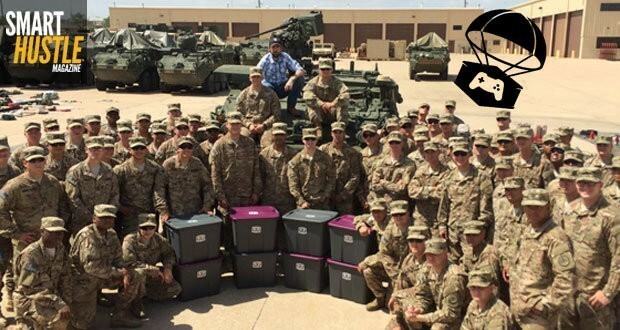 “What seems simple, isn’t always so,” muses Stephen, recalling a time when his unit received a care package of Girl Scout cookies and baby wipes. “Boy, were we happy, as cleanliness and snacks were hard to come by in the Iraqi desert. Unfortunately, the box had taken a full month to get to our unit and had cooked, melted and co-mingled in the scorching Iraqi heat and solidified again in the freezing desert nights. Let’s just say cookies that taste like baby wipes are not the most inspiring,” laughs Stephen, reflecting on his and his soldiers’ disappointment when realizing the Girl Scout cookies tasted like soap. Most of the soldiers serving today are barely out of high school. There are many of them that have answered the call to serve their country in harm’s way. Contrary to the movies, they spend most of their day sitting around, waiting for something to happen, always anxious and under pressure. When it happens, it is usually unannounced, quick, dangerous, stressful and often over as quickly as it began. Then there’s the mind-numbing wait for the next time.